I put off doing this project for quite a while, because I was never in the mood to walk my pregnant self into a liquor store in search of vodka. I finally bought some one night when my husband, son, and I were walking around downtown Chattanooga, and happened to pass a liquor store. Imagine my husband standing outside waiting for me with Levi in his stroller yelling "Mama! Mama!" across the parking lot, as his pregnant mommy comes walking out of the liquor store with a big, brown bag in tote. I'm sure I looked like mom of the year. Most sources say to use about 5 beans per 8 ounces of alcohol. Wash and thoroughly dry containers. Place the beans in glass containers. Fill the containers with alcohol, fully covering the beans. Tightly seal the containers and store in a cool, dry place for eight weeks. You can add more alcohol to the bottle as you use the vanilla to make it last a really long time. 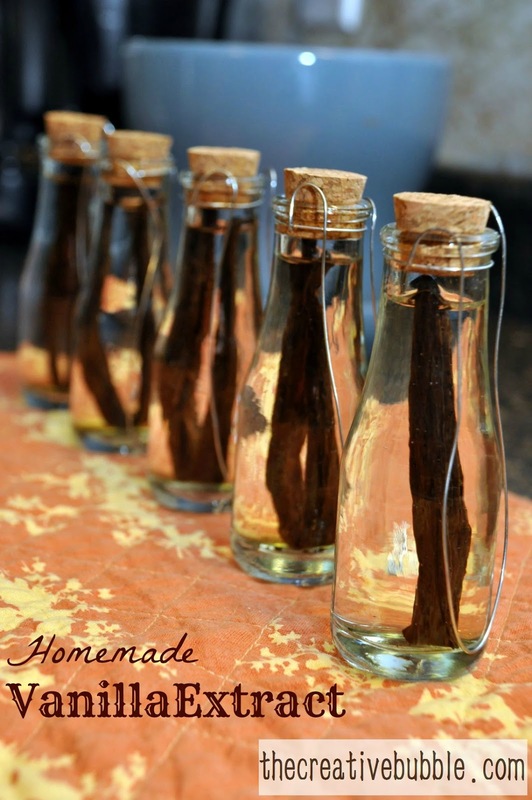 There is some debate as to how long the vanilla should be stored before using. Some people say three weeks and up to six months. The most common length of time I have read is eight weeks. I found these little bottles at Hobby Lobby. You know how you have to pay up to around $10.00 for maybe four vanilla beans at the grocery store? I'm not a fan of that at all. Amazon sells 25 Madagascar vanilla beans for only $14.99! Using a funnel makes this part much easier! I can't wait until it's done "cooking" so we can make something for the first time with pure vanilla! I've been nominated for the Liebster Blog Award by The Turquoise Home and Mom's World. A big thank you to my sister in law, Laura and to Darla! I feel so honored!! In case you don't know what the Liebster Blog Award is, it's an award given by bloggers to up and coming bloggers who have less than 200 followers. It is to show new bloggers that they are appreciated, and to help spread the word about new blogs. It was created to promote appreciation and recognition among the blog world. Liebster translates to "dearest" (or favorite/best) in German. It is also known as the Love Blog Award. 1. My husband, Michael, and I bought our first home in May of this year. 2. I cannot wait to have a fully functioning garden someday (hopefully next Summer, but probably not until the next year) to have organic produce at home for much cheaper than the store. 3. I LOVE chocolate. Michael doesn't, so that means more for me. My son, Levi loves it, too, so now I have some competition. 4. I really enjoy creative writing. I just have a problem with plot planning! 5. If my house were on fire, the first thing (besides my family) that I would grab would be my external hard drive and Levi's baby journal. 6. I used to make cakes, cookies, etc. for my small business called The Sugar Blossom, but quit when I became pregnant with Levi. I honestly found that it took a great deal of time to make cakes while the price I felt comfortable charging people wasn't enough. Now I just bake for fun! I am wanting to try to make macaroons for the first time soon. 7. I don't think I've updated the music on my ipod since Michael and I got married in 2008. I guess that means I'll be wearing mom jeans soon, too! 8. My Myers Brigg's test results are INFJ. I like to learn or try figure out what other people are, too. 9. We don't have any pets, but when the boys get older, I would absolutely love to get a poodle! I grew up with them and love them, but also have allergies to most other dogs. 10. I think I should exercise a little more (who doesn't!? ), and am excited to get active after our baby is born in February. 1. How did you meet your spouse, if you have one? If not, tell your best love story. I had briefly met him through friends in 2007. Later that year, he was looking for a job, and applied where I was working. I thought he was cute, and begged for him to get hired. We worked together well, started dating, then got married in 2008! 2. How long have you been blogging and what inspired you to blog? I started blogging about three years ago, but never shared any of the blogs with the public until I started this one in March. I was inspired to blog, because blogging inspires me to try new crafts and recipes to share. It's an outlet for creativity, and I love it. 3. What is your #1 item on your bucket list? I don't really have much of a bucket list. Maybe I should make one :) One thing I'd love to do is to travel with my husband when our kids are older. I have been to Ft. Lauderdale a couple times, and think it's so wonderful there. I love the weather and beaches. Michael and I want to go to California as soon as we can! 5. What is your favorite holiday tradition? Just recently we had our annual Christmas baking day with my family. My mom hosts it at my parents' house, and my grandma, aunt, sister, cousins, and I bake TONS of cookies for an entire day. It's so fun! 6. What is your favorite meal? I love chicken pot pie and mashed potatoes with gravy. I am from Tennessee after all. Lately, I stare into the closet hoping that some of my black leggings are clean. Then, I find any cute long shirt or dress I can to go with them. Perfect pregnancy outfit! 8. What are your favorite blogs to read? List at least 3. I love comedy blogs. Crappy Pictures is a hilarious parenting blog accompanied by handmade drawings. I also like the organic/natural living blog, Keeper of the Home. I enjoy following Faithful Provisions to keep up with couponing/money saving ideas. I have been working on making homemade Christmas gifts. I'm currently working on a good powdered hot chocolate recipe. I've also wanted to try making rice heating/cooling pads. They require sewing. Wish me luck! 10. What is your favorite project you've ever done? 11. Are you a person who can't live without coffee? Or do you like tea? I like coffee about once or twice a year, and I mostly drink it for the cream. I do adore the aroma, and love when my husband makes it in the morning. It reminds me of travelling, because the airport always smells like coffee. I like herbal teas. 1. Are you brand-loyal to any product? Hmm...Yes. I only use Clear Care contact solution. It's the only kind I've found that doesn't irritatate my eyes. That was a boring answer, huh! 2. Do you have a story behind your kid(s) name(s)? 3. What is your favorite board game? I love to play BIG Boggle! It's hard to find in the stores now, though. 4. Have you ever been to Disneyland/Disneyworld? I have been to Disney World, but we really want to go back with our kids as soon as we can! I'd have to say that Amelie and Forrest Gump are my favorites. 6. What did you want to be when you grew up? I used to say veterinarean, doctor, or natural doctor. Now I just want to be a mom, and maybe someday a nutritionist or a children's art teacher. 7. What is one of your favorite childhood memories? I won a contest and got to go into a money machine when I was little. It was so exciting! I only won $8. 8. What city do you live in and do you like it? I live in Chattanooga, TN. It is an absolutely beautiful city! The mountains are great. 9. How long have you been blogging and why? 10. Do you have someone you idolize or look up to? I love HGTV and The Food Network. Narrowing it down to one is tough. I like Next Iron Chef! 1. When it comes to blogging, what types of things do you enjoy: photography, writing, crafting, sharing, networking, etc.? 2. What types of blogs do you like to follow and why? You can list them if you want. 3. Do you think it's difficult to find the time to blog? Do you schedule certain times to work on your blog? 7. What's the first thing you would grab if your house was on fire (besides pets and family members)? 8. Do you have a job in addition to blogging? ...or are you a stay at home mom? 10. What are some things your dream home would have? 11. Can you recommend any good books? Why do you like it/them? I really love seeing the grocery store shelves lines with eggnog around Christmas time. It's a fight for me to not grab a different kind of "special edition" eggnog each time I go shopping. Eggnog desserts are all over the place online now that we are approaching Christmas. 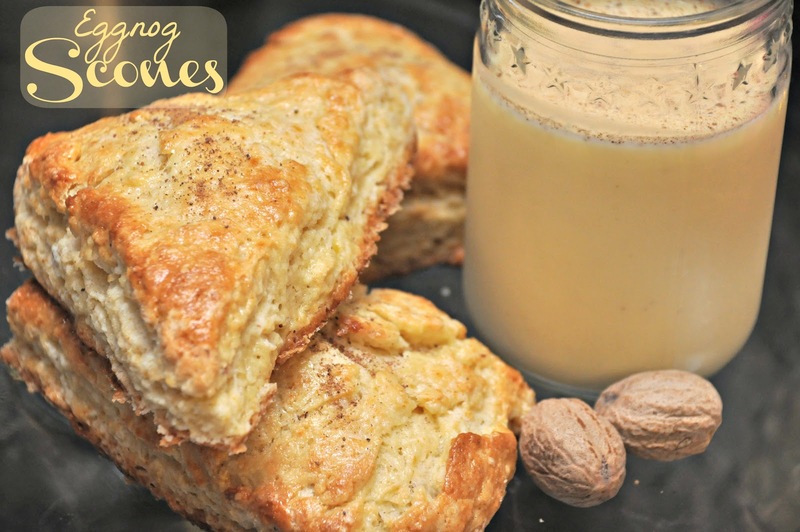 Scones sounded really good to me, so I wanted to experiment with my own eggnog scone dessert created from a combination of many scone recipes I've encountered. Stir together flour, baking powder, salt, nutmeg, and sugar in a large mixing bowl. Cut the butter into tablespoon-sized pieces, and incorporate them into the dry ingredients. In another large bowl, whisk together the eggs, vanilla extract, rum extract, and eggnog. Turn the dough out onto a floured surface, and knead to combine. Be sure to not over-knead. If you are using a scone pan (wish I had one! ), separate the dough into equal pieces, then press them into the (lightly greased) pan. If you aren't using a scone pan, separate the dough into two halves, then shape each half into a circle. Cut each half into equal size wedges. Brush with the eggnog, then sprinkle with the granulated sugar. Preheat the oven to 425°. It's a good idea to place the pan of scones into the freezer (uncovered, 30 min) before baking them. Then, remove them from the freezer, and put them into the preheated oven right away. Bake for 15-20 minutes or until golden brown. Allow them to cool on a wire rack. If you'd like more of a creamy topping, you can make a fresh eggnog glaze right before serving. Delicious! Melt butter in small sauce pan over med-high heat. Add milk and rum extract once butter is melted. Remove from heat. Slowly stir powdered sugar into mixture. Paint onto scones. I like to paint a thick glaze onto each scone. Sprinkle nutmeg over scones. 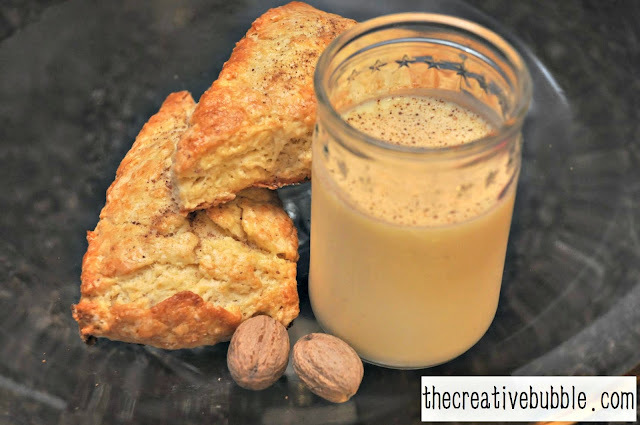 It won't take much nutmeg to add flavor to each scone. I think it's so fun to mix essential oils together to come up with a really nice scent. I recently came across crunchybetty.com's tutorial on making solid perfume, and decided I must try it! They will be Christmas gifts this year. First, I'll tell you where I found the tins, because that was a journey in itself. This site has really cool bath and body product packaging. I just love the little tins! You can decorate them however you want or leave them plain. They were only $.55 each. I found the sticky-backed gems at a local craft store. I would rate this project as being easy. First, you will want to test out several essential oil blends until you come up with one you like. Use approximately 45 drops of essential oil per 4 tsp solid perfume base. It's a really good idea to measure out how much essential oil you will need, then go ahead and premix it, so it's ready before you even start melting the beeswax. Once the beeswax is almost all the way melted, stir in the carrier oil. Keep it on the heat, while stirring until everything is melted. Be prepared to work quickly for this next part, because the mixture will harden very soon after it's removed from heat. Remove mixture from heat, then pour in your essential oil blend. Next, pour the perfume mixture into your containers. This part was so exciting for me! I couldn't wait to smell the final product. After about 10 minutes, the perfume will be completely set up. Try it on, and see if you like it! If you don't like the final product, you can always use something to get it out of the containers, then reheat it (being sure to not leave it on the heat past the point that it is melted, so you don't lose any essential oils to evaporation). You can always add more essential oils to the mixture if you need to. I was testing out the oils on a paper towel. Our home smelled like insane after all this mixing! These are the little jewels I used to decorate the tins (found at Hobby Lobby). My final scents were Lavender Citrus Rose and Citrus Patchouli. I added patchouli to the second perfume at the very end, and my oh my...it was strong! That's why it deserves a spot in the perfume title :) I really liked grapefruit and rose together, too, but didn't do that combo. The hardest part of this whole project was coming up with a blend of oils that I liked. It's super fun too though! dōTERRA essential oils blends are incredible, but I also like creating my own from their single oil selections. Oh, and another difficult part was washing everything the beeswax touched. Soap and water just don't cut it. Get as much out while it's still warm, or reheat everything just to clean it. Simply wiping everything off with a paper towel, then trying to wash it made it so much easier. If you make your own perfume, I'd love to hear which scents you choose! If you're looking for gift ideas, check out the bath gift baskets I made for Christmas last year, and the chocolate lip balm (chocolate mint & chocolate orange) I made this year. ...to this in about thirty seconds. Before having a child, I could clean the house, and most likely it would stay that way for a good while. Now, not so much. I know several of us moms have seen the someecard that says, "Trying to clean a house with toddlers, is like trying to brush your teeth while eating oreos." SO TRUE!! 2.) One day you will think you have found their favorite food, then the next you will get this face when you give it to them again. 3.) Floor food is fair game. Sometimes Levi won't eat a bite of what I give him, but when he gets out of his chair to find the same food on the floor, it suddenly looks delicious! 4.) You will go through more batteries than ever before. 5.) You find old milk and juice cups days after they've gone missing. Yes, it's true, and gross. How do they come up with these hiding places? I'd rather find the old penicillin growing juice cups than the stinky week old milk ones. That's me in the reflection below. Hi everyone! 6.) Your Christmas tree might look like this! 7.) "NO" means no, and it also means yes. "Levi, do you want any more spinach?" "No," he says while shaking his head. "Do you want some milk?" Then, he gets upset and reaches for it like, c'mon mom, I said I wanted some more milk! 8.) You begin to wonder who the boss of the house is. I'm discovering how determined a toddler can be. He knows what he wants, when he wants it. 9.) You've had to fetch at least one object out of the toilet. ICK! 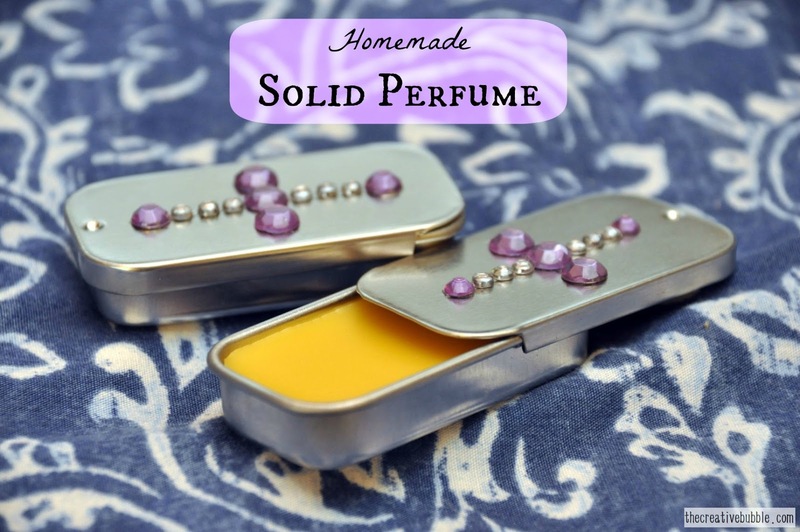 I recently made some solid perfume for Christmas presents this year. Levi happily tossed one of the containers into the toilet. Don't worry friends who might be getting one for Christmas, I threw it away! 10.) You had to finally lock up the DVDs that you thought were safe. Maybe you did this way before we did. I think we were naive to the DVD scratching desires of toddlers. We just put a lock on the DVD cabinet after Levi caused one to skip really bad. DVDs make the best toys. I hope you enjoyed the list! I'm sure there will be a part II in the future.